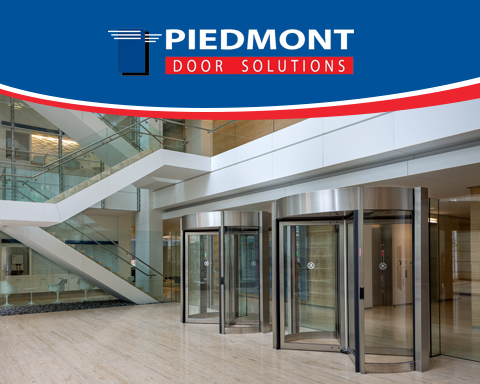 Since 2001, Piedmont Door Solutions (formerly known as Piedmont Door Automation) has been the customer’s choice for Pedestrian Door and Entrance Solutions. From our six locations, we provide expert entrance services – Design, Installation and Service – for Commercial, Industrial and Institutional Customers throughout the Southeast United States. Our experienced staff can help you design the perfect entrance for your facility. We provide turn-key installation service with the focus being non-disruptive, clean and efficient. We service all makes and models of automatic and manual doors and hardware. Sliding doors, swinging doors and revolving doors. Wood doors, hollow metal doors, and more. Revolving doors, portals and turnstiles. For more information about our products and services, please contact us via phone at 866-527-0711, use our quick and convenient Online Request Form, Email Us, or visit our Contact Page to connect directly with a location nearest you.